Véronique Dehant, scientific researcher of the Royal Observatory of Belgium has been nominated Doctor Honoris Causa of the Paris Observatory on November 13, 2014. 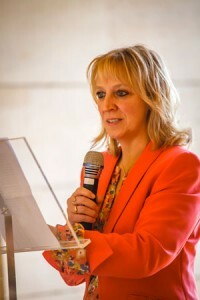 Véronique Dehant works at the Royal Observatory of Belgium, where she is responsible for the Operational Directorate “Reference Systems and Planetary Science”. She is also Extraordinary Professor at the Université Catholique de Louvain. She was or is involved as Principal Investigator (PI) or Co-Principal Investigator (Co-PI) or Co-Investigator (Co-I) of several radioscience space experiments aiming at planetary geodesy and at physics of the interior of terrestrial planets. She is Academician (Royal Academy of Belgium; Science class) since 2010 and was awarded with several prizes, including the Descartes Prize of the European Union in 2003. She has taken several international responsibilities at President level such as President of the Geodesy Section of the American Geophysical Union. She is author of more than 415 publications including 150 refereed publications, and of more than 900 oral or poster presentations at the present date (November 2014).